This August on Zee TV, channel 452 on the DStv Indian bouquet, will see the start of two new series: a heart-warming “ghost” story followed by a take on a much-loved classic fairy tale and two recent movie blockbusters on the small screen. Coming this month is the charming tale of Bhootu, starting August 22 at 17h00 CAT. Bhootu is the jolly little ghost of 7-year Pihu, who had died in an accident. Bhootu does not understand that she has now turned into an invisible ghost and she keeps waiting for her family to return to the house where she lived as Pihu. As Bhootu, she looks and behaves like any other human being with emotions, mischievous ways and childish humour. Many families, couples and individuals come to stay in Bhootu’s house and she gets emotionally attached to these families as if they were her own. Being somewhat aware of her magical power, the cute little ghost goes around the house trying to set things right for the new members of the family with whom she relates to her own family. In her attempts to help the different people who can’t see her, she causes some hilarious ruckus and sometimes manages to mend things right and bring happiness to the family. Also new to the channel is the Hindi adaptation of Beauty and the Beast - Jeet Gayi Toh Piya More. Set in a small Rajasthan town, Devi Chauhan is engaged to Adhiraj, from the cursed Rajawat family. The animosity between the two families has survived through decades and now to save her family, Devi has no choice but to take control of her destiny and marry the “beast”, Adhiraj. Devi’s sweet nature and resolution will endear her to viewers, but will this tenacity go a long way to win over her husband and transform him to become the man of her dreams? Watch Zee TV to find out more, starting August 22 at 17h30 CAT. Zee TV follows this with two recent blockbusters. A Flying Jatt, premieres on August 12 at 16h00. 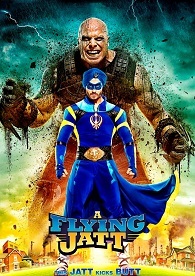 This superhero film made in 2016, features Tiger Shroff, Nathan Jones and Jacqueline Fernandez and in the lead roles. Aman (Tiger Shroff) is a meek youngster who is terrified of heights and discovers his superpowers when he is forced to face the evil Raka (Nathan Jones), who is sent by an industrialist to destroy humanity. The story begins when a strong influential businessman Mr Malhotra (Kay Kay Menon) who has his factory on a land near a lake into which pollutants and toxins are leaked. He wants to build a bridge across it for faster transportation but cannot do so due to a sacred tree present on the other side of the lake on a piece of land which belongs to Mrs Dhillon, Aman’s mother. Malhotra, who wants to get rid of the tree, brings in Raka, a mutant, to get the job done. The battle between good and evil ensues. Will our superhero overcome the villains at play, as well as his fears? Watch out for A Flying Jatt headed your way on August 12! Rounding off the August treats is the most recent blockbuster Naam Shabana, which is fresh off the movie circuit this year. On August 27 at 16h00 the premiere is a spin-off from the 2015 movie, Baby. This 2017 action spy-thriller movie provides the back-story of intelligence agent Shabana (Tapsee Pannu), and chronicles how she becomes a spy. Other cast includes Akshay Kumar, Manoj Bajpayee, Anupam Kher and Prithviraj Sukumaran, who all play important supporting roles in the film. Incidentally, lead actress Tapsee Pannu found the prospect of working with a major action star like Akshay Kumar intimidating, because of the high standards Akshay Kumar sets. The film begins with two Indian agents working under Ranvir Singh (Manoj Bajpai) chasing an international arms dealer Mikhail (Prithviraj Sukumaran), who has been on the radar of several intelligence agencies, but instead he kills them both and escapes. A year later, Shabana Khan (Taapsee Pannu) a college student who is also a Judo fighter is being followed by Indian agency as a potential recruit. Shabana is recruited into the secret agency on a trial basis, where she is to receive extensive training in physical fitness and fighting techniques. The story then focuses on her target - global arms dealer and supplier Mikhail. This action-packed movie is bound to keep audiences on the edge of their seats.